Fantastic course! By far the most useful and inspiring course I've been on in my 15 years of teaching! My face aches I've been smiling so much!! The ideas and enthusiasm shared has inspired me. I can't wait to go back and share! It was so much more than expected - resources, ideas, application, links to everyday life in the classroom. Wealth and knowledge and experience relating ideas to OFSTED requirements whilse being current, fun and immediate. Thank you so much for an inspirational day! 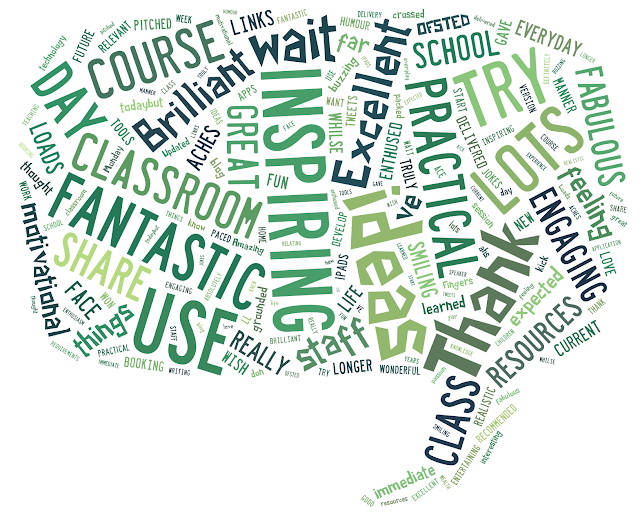 Feeling enthused - so many ideas to try and share with staff. Only wish the day had been longer! Engaging speaker - inspiring and motivational. Gave lots of practical ideas I could use in my class. Can't wait to try them. What a fabulous day! I have learned so many new things and I can't wait to try them out on my year 4 class! A truly EXCELLENT day- Thank you! Fantastic ideas delivered in a well pitched and inspirational manner. My children will love using these tools! Fantastic delivery - thought I knew lots about using iPads in the classroom before todaybut so many ideas - absolutely buzzing - thank you! Fantastic delivery. Will definitely be booking on future courses. Brilliant! Thank you and thank for your blog and tweets too! Brilliant! So many engaging, relevant ideas! Inspirational, grounded in realistic day practicalities. It will really kick start our writing! Thank you, how can I share this with such humour and passion with my staff? I'll try, but my jokes won't be as good! Really useful ideas to develop writing. Useful apps that can be used, a great course - thank you! Very imformative and lots of good resources recommended/used in session. Will be good to use ideas in class. So inspirational! Loads of wonderful ideas to take back to school to motivate the children! Fantastic delivery and very inspiring, will go back to work with many useful ideas! Lots of fantastic ideas! Can't wait to get back to school to try all the ideas! Definitely feeling inspire to inspire! Thanks for a fabulous day with lots of practical ideas! Inspired to take into classroom! Fingers crossed I can take the passion you show back to the other staff! A great course with lots if practical ideas for use in the classroom! Fabulous! I just want to do everything next week! Excellent! Can't wait to try these things on Monday! Brilliant! So inspiring and so many practical ideas to use in school! Inspirational! Good Paced and packed with great ideas. It ahs been brilliant! Thank you! Excellent ideas! Can't wait to try them with my class! Updated version of technology use - absolutely ace! Will be using! Excellent! Loads to go home with - don't know which to try first! Great ideas to take back and use in the classroom! Very interesting and useful. Lots of ideas! For all of my other upcoming courses and conferences - click here.